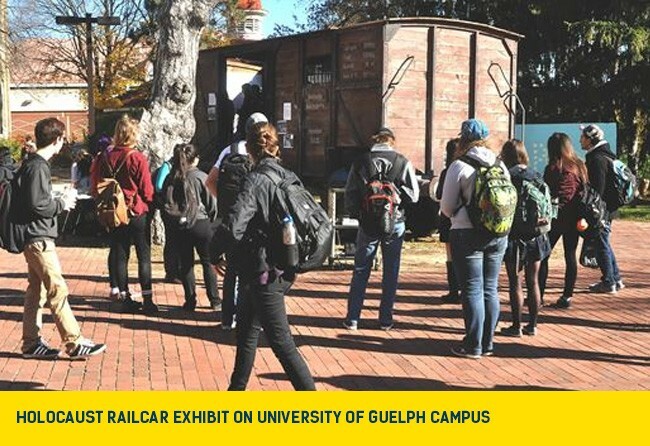 This year, during Holocaust Education Week (HEW), University of Guelph Hillel student leaders singlehandedly came up with an innovative way to connect the tragic history of the Holocaust with students on campus today. Over the course of the past week -- with the financial support of Hillel Ontario and the Centre for Israel and Jewish Affairs (CIJA) -- University of Guelph students were given the unique opportunity to step inside a replica Cattle Car, similar to those used to transport Jews to Nazi concentration camps during World War Two. During HEW, the Cattle Car was parked in the centre of the campus at Branion Plaza, and included information about Hitler’s rise to power, Nazi propaganda, and the systematic murder of millions of Jews. In its first 24 hours on campus, more than 2000 students, faculty, members of the administration and the community at large from all backgrounds walked through the cattle car and the exhibit set up inside. Additionally, on Thursday, November 5th, more than 1,000 students and members of the University community were in attendance to listen to Hedy Bohm speak about her experiences as a Holocaust survivor and as a witness testifying at the Oskar Groening trial this summer. The reaction on campus was overwhelmingly positive, and numerous media sources reported on the display, including this clip from CTV News Kitchener.